RTA EVENT CALENDAR CONTACT US RTA EVENT CALENDAR CONTACT US ADVERTISE Stella-Jones Corp. Railway Tie Association Wheeler Lumber Nisus Corporation MiTek Industries CROSSTIES • JANUARY/FEBRUARY 2018 7 RTA Executive Director Jim Gauntt presented a market update for wood crossties and moderated a panel addressing industrial markets at the recent Indiana Hardwood Lumbermen's Association (IHLA) Annual Convention in Indianapolis. 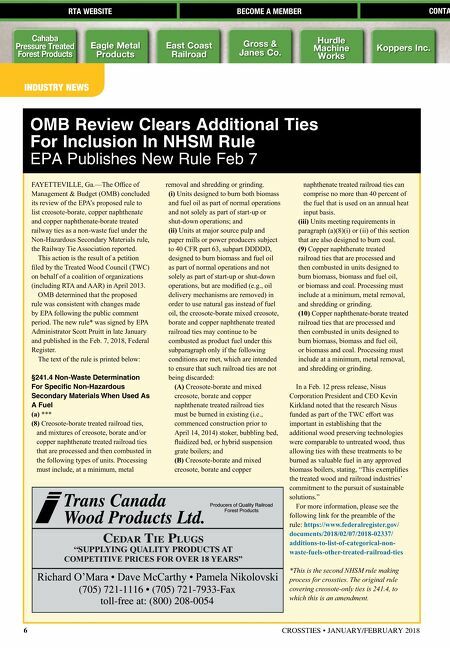 "I was incredibly impressed with the 1,100-person gathering of hardwood sawmillers and suppliers—the information flow and networking is tremendous. Ray Moistner, IHLA's executive director, and his team organized a great event," Gauntt said. IHLA is an even older organization than RTA or the American Wood Protection Association (AWPA), dating back to 1899. Focusing on the production of the world's finest hardwood products and sustainable forest practices, IHLA's communication strategies and technologies are designed to help its members meet the ever-challenging world markets. The industrial markets session was a new panel developed by IHLA to share information on the primary industrial products that now make up over 50 percent of the total U.S. hardwood market volume. In addition to the RTA message, attendees heard from the National Wooden Pallet and Container Association's Mark Barford on pallet markets, IKD's Yugon Kim on hardwood cross-laminated timber design and certification, Smith Creek's Matt Smith on the marketplace for hardwood residuals, and Domtar's Dan Allard on the effects the digital economy is having on paper markets. Another well-attended session was devoted to the divisive issue of log exports to China (see page 17 for an RTA update on this topic). American Hardwood Export Council's Mike Snow noted that China is hungry for fiber primarily for domestic consumption. Snow noted that since Myanmar and Ukraine banned log exports in order to devote those resources to the world's high-end veneer markets, and Russia's increased export duty on logs, Chinese buyers have turned to the United States for hardwood lumber and logs. Other concerns were raised about timber stand management and if sustainable forest management practices can be maintained with increased logging. In response to that concern, Indiana State Forester Jack Seifert said that if it's a concern about supply sawmillers need to realize that every state east of the Mississippi River is growing twice as much as is being cut today—it's actually more a matter of gaining access to that fiber since hardwood forests are mostly privately owned. Seifert indicated the concern should be on how to cut the tracts to increase the growth rate for more valuable species. Philip Fisher of Maley and Wertz Hardwood Lumber Company gave an example of one tract of timber that he managed. Forester #1 came in and said that the way he would cut that tract for maximum long-term value would produce $25,000 in revenue. Forester #2 came in and quoted $85,000, but that would have meant cutting everything down to an 11" DBH tree. Fisher noted that this would have devalued future cuts and advocated for best practices in timber stand management. A couple of questions were answered. For RTA members who have noted that containers to China cost less to ship than overland shipping in the United States, the panelists made the point that it's the "old back-haul situation" that allows this advantage. The Chinese need the containers back, so why not fill them with material rather than shipping them back empty? The concern about whether logs were being fumigated before shipment was also addressed. The panel pointed out that the requirement to apply phyto-sanitary practices is determined by the country the material is being shipped to. Hong Kong, the port where most logs are being sent, does not require fumigation and is effectively a loophole for logs entering mainland China. Many other issues were discussed during the Q&A, and it became clear that a consensus was not going to be reached during the session. "For those who have never attended IHLA, it's quite clear there is a wealth of knowledge and value in learning from the experts and the exhibitors at this event," Gauntt said. "I encourage members of our industry who have never attended to consider doing so in the future." 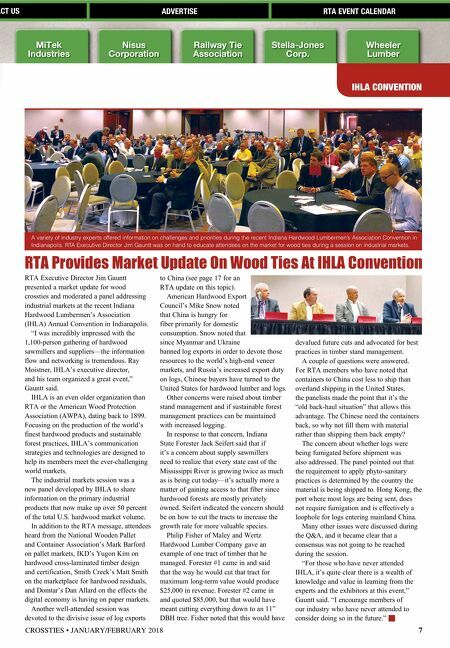 IHLA CONVENTION RTA Provides Market Update On Wood Ties At IHLA Convention A variety of industry experts offered information on challenges and priorities during the recent Indiana Hardwood Lumbermen's Association Convention in Indianapolis. RTA Executive Director Jim Gauntt was on hand to educate attendees on the market for wood ties during a session on industrial markets.